Upon starting a Project tasking for Einstein, BOINC grabbed one CPU thread and 0.5C + 1ATI. Is there any way to modify the configuration? Perhaps in the app_config.xml file. See the answer I gave you in your other thread. It will explain the use of the GPU utilization factor of BRP apps preference. Do know that the Einstein OpenCL applications like to have a whole CPU for themselves. Then the calculations will really speed up. This is because the Einstein OpenCL app will partially run on the CPU and partially on the GPU. You can set BOINC to use one less CPU by setting preferences for On multiprocessors, use at most 87.5% of the processors. This free core will then be used by the GPU explicitly. How much will the calculations speed up? Factor of 10. When running this way, tasks run for approximately 10-15 minutes on your 7700. When you do not allow the CPU to be free, this will increase to several hours. See this thread for benchmarks. And yes, this will run any other projects with one less CPU core, but would that matter? Thanks for the info. 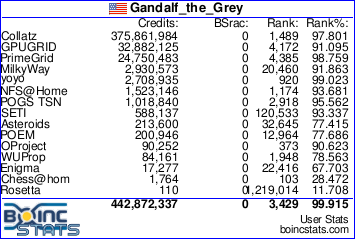 Have modify my BOINC setting to 87.5%.